Hamilton & Marshall Funeral Directors in Newport has provided funeral care to the Isle of Wight for more than 50 years. We can provide a heartfelt funeral for your loved one. Our professional team of funeral directors is here for you when you need us, offering support and comfort at a difficult time. We will ensure your loved one’s funeral is a deeply personal farewell, tailored to your specific wishes. This means it does not matter what kind of ceremony you are looking for, we have the years of experience to ensure it meets your wishes. From a traditional funeral to something a little more unique, such as a woodland burial or a horse-drawn procession, we can cater for all preferences, along with religious and cultural requirements. 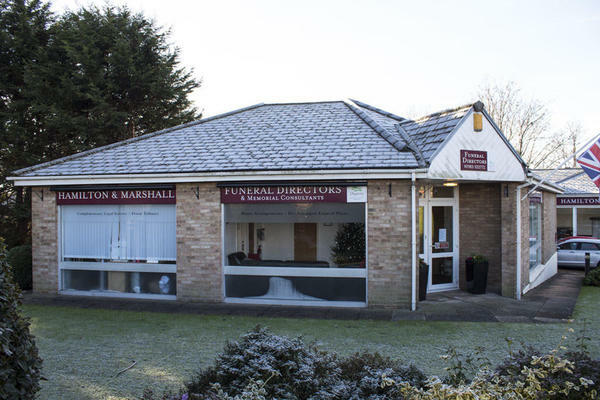 Our funeral home is located on Medina Way and, as well as Newport, our Isle of Wight funeral directors offers funeral services to nearby villages, such as Blackwater, Northwood and Wootton Bridge. We have full disabled access and a chapel of rest in which you can spend time with your loved one in a peaceful and private environment. We can also open the chapel of the rest outside of hours to suit the needs of you and your family. Our team is here to listen when you need us and available 24 hours. To arrange a funeral for your loved one, give Hamilton & Marshall Funeral Directors a call today. Call us today on 01983 522772 to talk through your personal requirements. At Hamilton & Marshall Funeral Directors, we understand how special life is with those that you love. For us, every funeral is unique and personal. We have a service to fulfil every wish, with every detail carried out with the same uncompromising quality of care. From a traditional service, to a colourful woodland burial, your options are limitless with our Full Service Funeral. If you have a little more flexibility when it comes to arrangements, then we can provide a Simple Funeral for a lower cost. We are located just off the Newport dual carriageway, opposite Lidl. Our staff are available 24 hours a day on 01983 522772 if you require our services outside of these hours. We were all very pleased with the service provided by Hamilton and Marshall. Louise and Matthew were very helpful and friendly. Everything was explained to us. Thank you for posting your review online. I am glad we were able to provide you with the support and guidance needed and that the arrangements for your Sister were carried out to your satisfaction. We could not have had a better or more helpful experience. The understanding of our situation was comforting at all times. We received first class service from the team at Hamilton and Marshall , they were professional, respectful and friendly and patient . Nothing was too much trouble, we were kept informed every step of the way, we couldn't have asked for better. This is the second time of using Hamilton & Marshall, and on both occasions they have always conducted everything with the utmost respect and dignity. A very special thanks to Mathew, Andy and Sue who dealt with everything and were always respectful and professional in every way. At a time of grief I was made to feel that every need would be fulfilled, and indeed it was. I would have no problem whatsoever in recommending Hamilton & Marshal for their services.